Table is easily adjusted via handwheel conveniently located at front of machine. Any miter angle can be set-up within 10 seconds! M-24 machines miter cut up to 75 degrees from 0 (90 degree cut). Cut length on 2 x material with fence at standard position (single point of cut) - 12 inches. Typical cuts are: 90 deg.on 2x12s - 30 deg. on 2x10s - 45 deg. on 2x8s - 60 deg. on 2x6s - 70 deg. on 2x4s. 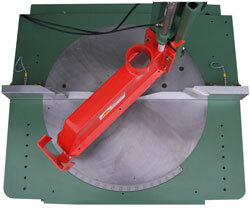 M-24 machines are capable of cutting 2x8s on edge for bevel cuts. 8x8s cut with ease. Solid or roller infeed & outfeed tables. Manual & Air operated 6" high x 9" long swing up material stops. Full CNC automatic cut off stop/feed systems. 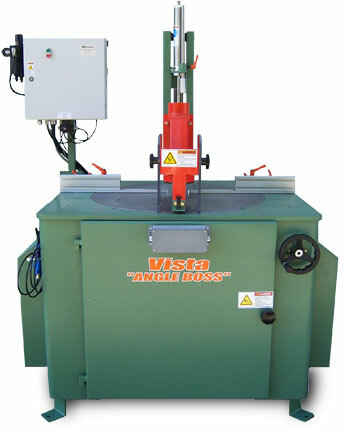 Only quality components which are readily available from Vista Machines or any number of supply houses across the country are used in the manufacture of “ANGLE BOSS” cut off saws. For more information or to find the nearest "ANGLE BOSS" dealer, please contact us!